There are numerous noise sources in ports and waterways, including horns, whistles, signals, terminal operations, engines, construction and logistics. As well as ensuring compliance with environmental noise regulations, operators must minimise, mitigate or reduce noise from both essential processes and other sources. As a result, monitoring the impact of sound levels on local communities can be a complex issue. Operators and contractors need to regularly monitor compliance with noise abatement procedures and regulatory requirements, plus investigate enquiries or complaints from members of the public. 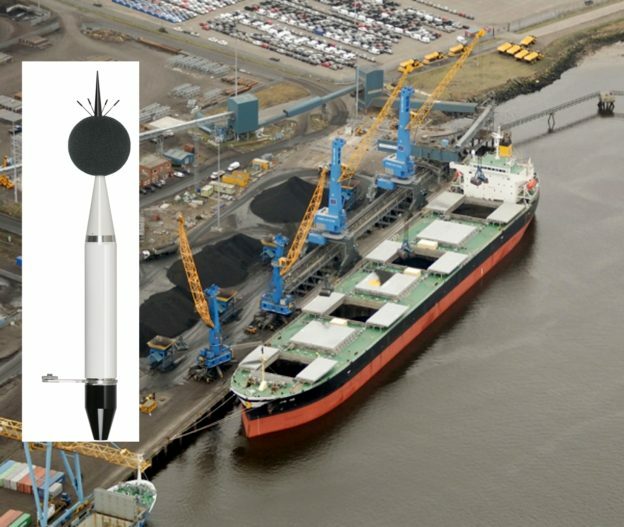 An increasing number of port operators such as Felixstowe, Port of Tyne and Peterhead are choosing to install a permanent noise monitoring solution, which allows them to capture sound levels in real time and gain a better understanding of existing noise levels and also track changes over time. Svantek’s SV200 outdoor noise monitoring station offers reliable, accurate and continuous operation in the harshest conditions. A fully integrated solution for unattended long or short-term noise monitoring applications, the weatherproof SV200 is small, lightweight and easy to install by a single person. It has its own built-in web server that can continuously provide live, real time data, 24-hours a day, seven days a week, to a computer or hand held device. It will send an email or text message if the noise levels go above a pre-set limit and measures and stores results suitable for automatic reports and detailed information for advanced post processing analysis. Standard measurement functionality includes multi-profile data logging, real time 1/1 and 1/3-octave logging, audio event recording and statistical analysis. Measuring capabilities can be extended with real time audio streaming and weather condition monitoring. All results are securely stored on the built-in 16GB microSD card. The reference direction is user selectable in the instrument configuration and a highly efficient windscreen reduces noise, even at high wind speeds. It features special rain protection and weatherproof housing protects the SV200 noise monitoring station against extreme weather conditions while fulfilling IEC 61672 Class 1 accuracy. Weather conditions have a significant influence on noise measurements so the SV200 is equipped with an interface for meteo sensors. With the optional SV205 weather station, the SV200 can measure wind speed, wind direction, temperature, humidity, ambient pressure and rain. Weather data is stored in parallel to the noise measurements. Svantek’s SV200 features internal heating and rugged dual layer housing with natural airflow enabling it operate from -30°C up to +60°C and humidity up to 100% RH. It has a 2.45 Ah internal Li-Ion battery and interface for connecting solar panels. A waterproof mains adapter for charging the batter and powering the station is also included. The SV200 features an ‘all-in-one’ design making it suitable for portable, mobile and permanent noise monitoring installations. This means it can also be moved from one location to another whilst still being able to provide information as often as required. A mounting tool for mast or stand is included in the standard package.